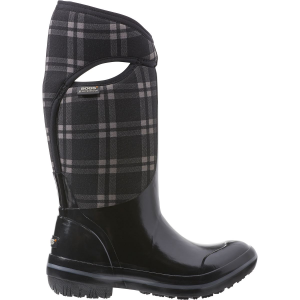 The weather might be gloomy, but at least the Bogs Women's Plimsoll Plaid Tall Boots help keep your feet dry and warm. From rain puddles to snow piles, the rubber shell and Bogs' Max-Wick waterproofing shields you from moisture while the four-way stretch inner booties keep your feet cozy. Toasty 7mm Neo-Tech insulation provides warmth down to -40 degrees Fahrenheit and the DuraFresh odor-fighting treatment keeps things fresh. These boots also have a contoured EVA footbed and non-marking rubber sole for durability and cushioning.